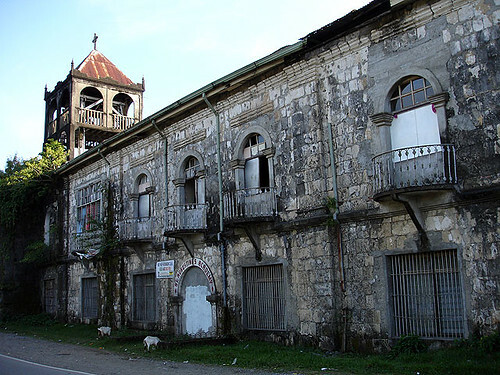 Today, nothing remains of Jesuit architecture in Borongan. Hardly any of Franciscan either except for Navarrete’s circular bell tower, a town landmark. The church fabric itself was drastically renovated, the façade replaced by a new one, the walls torn down to make way for more doors and windows. The church pillars though covered with cement and paint belong to the old fabric. Their positions give an indication of the size of the Franciscan-built church. “The castle of Guiguan . . . is the best and most regularly planned in all the Visayas. It exceeds in grandeur the celebrated fort of Zamboanga. The Fathers with the aid of the townspeople built the fort for their defense. It is quadrilateral, each side being 70 brazas long. At every corner is a bulwark. On these bulwarks six pieces of artillery can be mounted. Within the fort, which is all of cut stone, stands the single-naved church, large and capacious, and the house of the priest with all the necessary offices. It has four large patios, one serves as a cemetery and affords a commodious space for the schools. The other has a garden where a two-story warehouse stands. The kitchen is found in one of the bulwarks. On the bulwarks facing the sea are mounted six bronze cannons of various calibers, and a large one of iron, plus various lantacas, whipstaff, swivel guns, muskets and other arms which the ministers buy with the alms given by the inhabitants. They also purchase gunpowder and bullets as an annual surety with which they can defend the town from any armed enemy attack” thus Fr. Delgado (1754, 239–40) describes the fortification at Guiuan. The Guiuan fort is partially preserved. The southeastern bulwark where the Franciscans built a bell tower in 1854 still stands. So does another bulwark on the southwestern end, and parts of the southern and western wall. We gather from Delgado that the Jesuits did not build a bell tower because he mentions the bell used to sound alarms as hanging inside the fort. Mentally extending the remains of the southern wall shows it once bisected the convento built on the southern side. Although Repetti identifies this convento as Jesuit, he appears to be mistaken. Why build a convento outside the defensive perimeter? Besides, Delgado remarks that the Jesuits lived inside the fort. Rather the building on the southern side is the 1872 convento, while we infer that the Jesuit convento or what is left of it are the two rooms directly behind the sanctuary, beneath which the old sacristy stood. This would place the residence within the defensive perimeter, as Delgado states. Besides, the convento fits Huerta’s description of a stone building. The Franciscans apparently added a transept and a baptistry. This is the sense of Huerta’s “reedificada.” Architectural evidence bears this out. The main nave (Delgado’s single-naved church) is unified in its interior motifs and dimensions. Stucco angels decorate the church interior, and the doors leading to the choir loft bear the emblems of Mary and the Society above their arches. The main nave is more than two meters taller than the transept and the concourse from the transept to the main nave is impeded by a few centimeters of wall, unusual if the transepts were planned together with the nave. The transept appears as an afterthought. The thickness of the church wall at the transept opening is less than that of the rest of the church suggesting that room was made for some structure, very likely a retablo, which was then removed and transferred elsewhere. In fact, parts of that retablo are in the church. 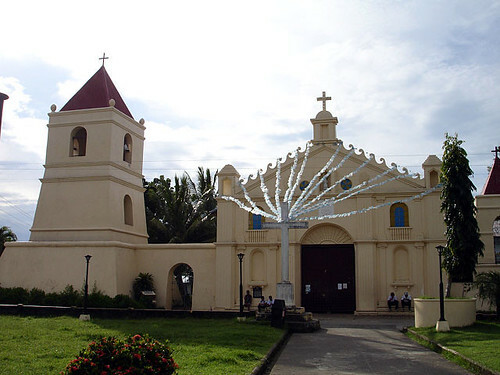 Guiuan owns numerous altars—a virtual history of the parish. Aside from the main altar two side altars stand along the nave. One bears mixed parentage, a retablo from Franciscan times and a rococo frontal with the Augustinian emblem. Each transept end has an altar. One which houses a templette has florid baroque motifs, probably remnants of the side altar from Jesuit times. The altar table itself is cuplike, typical of Franciscan rococo, similar to the altars in the Franciscan church of Baras. Could these altars have come from Luzon? The main altar belongs to the Baroque style and traces to the Jesuit era. Divided into a number of niches separated by solomonic columns and encrusted with heavy floral carvings, the impression created is that of being heavy and overwrought. The carved wooden altar frontal bears the image of the Virgin Mary flanked by kneeling priests in chasuble with the images of Jesuits saints in floral roundels. Two processional candle holders are shaped like altar servers or sacristans, dressed in cassok and surplice. One wears a medal with a monogram of the name “Jesus” and the other “Mary.” A pair of solomonic columns stretching to the ceiling flanks the main retablo. From a corbel shaped like a human hand hangs a pulley, probably used to raise and lower a sanctuary lamp or probably used to raise a curtain known as manto lanquin (manto from Spanish meaning veil; and lanquin from Chinese meaning black) that covered the altar from Passion Sunday to Holy Saturday. Huerta claims that the fabric of Basey Church comes from the Jesuits. But how much of it remained after de Madrid’s renovations is uncertain. The rounded transept ends and six freestanding pillars near the sanctuary suggest that de Madrid renovated this area rather extensively. 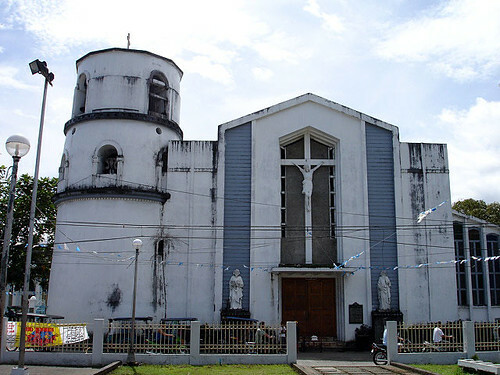 Rounded transepts are not typical of 18th-century architecture but appear in the Franciscan church of Tayabas, renovated in 1843. The façade is also atypical as there is no clear division between first and second story. A marker dated 1856 probably indicates that the façade was totally renovated. The lines of that façade are unfortunately obscured by a recently built cement porte cochere. In 1700s, Calbayog appears as a visita of Capul Island in the documents of this century. 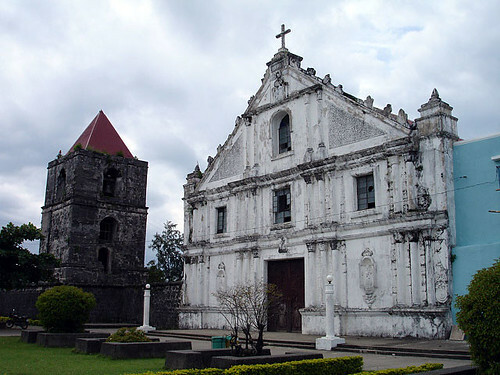 The Jesuits did not build a stone church in Calbayog., Ceded to the Franciscans with the rest of western Samar in 1768, Calbayog was attended to by Franciscans who resided in the neighboring towns. 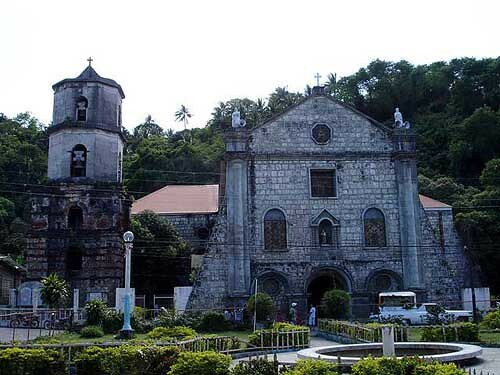 In 1785, it was raised to parish status almost two decades after the Jesuits had left but still it had no resident priest until 1788 when Calbayog had its first Franciscan pastor, Fray Benito del Carmen. 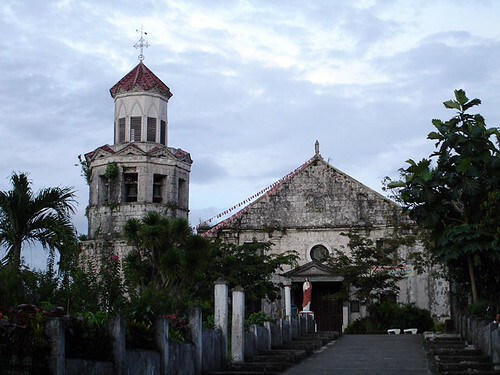 In 1581, the Augustinians established a mission in Kalibo. 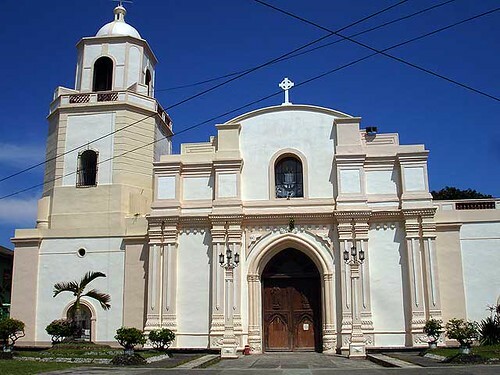 In 1680, the Kalibo was erected a parish under the advocacy of the San Juan Bautista Then, the town site was at Barrio Laguinbanwa in Numancia, some two kilometers distant from the present site of Kalibo. Here at Laguinbanwa, a church was erected but when town transferred site to its present location, another church was constructed at the new site (1804). 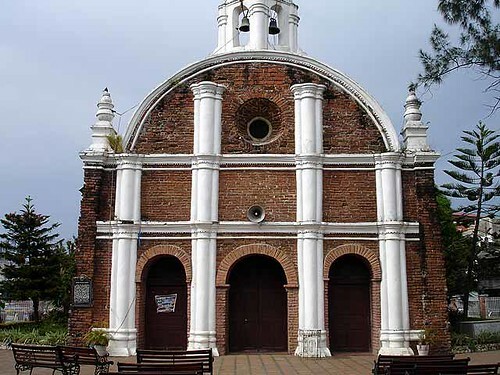 Both church and convento were completed completed in 1826. But tragedy struck the complex when on 24 May 1885 however, a big fire razed the town including the convento. The convento was reconstructed the following year (1886). 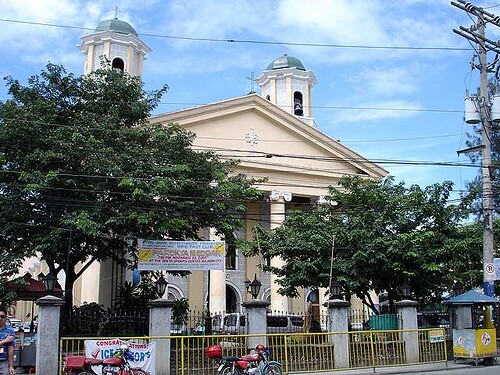 After the World War II, in 1947, Gabriel M. Reyes, Archbishop of Cebu and later Manila, personally took a hand reconstructing and remodeling the church. 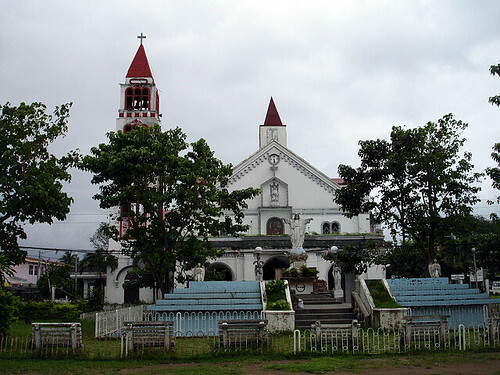 The church “On 14 June 1990, an earthquake measuring 7.1 in the Richter Scale hit Panay Island at 3:41 P.M., “The epicenter was located at 11.34 North latitude; 122.10 East longitude, in the vicinity of Culasi, Antique. The depth was computed to be 15 kilometers,” reported Philvocs. Damage to property included “The Catholic Church of Kalibo that is made of bricks (which) suffered cracks on its walls.” During the incumbency as bishop of Gabriel V. Reyes, a nephew of the former archbishop of Manila restored and improved the church to accommodate the many pilgrims who come to celebrate the feast of the Santo Niño. One of three places where the Augustinians built a church and convento of stone and mortar, Patnongon has unfortunately lost its much of historic structures due to human agency. Fray Manuel Asensio, appointed parish priest in 1860, commenced construction of the church. The succeeding pastors, Sabas Fontecha (1872-89), Wenceslao Romero (1889) and Eustaquio Hera (1895) continued work on the complex and completed it. Fray Joaquín Fernández designed and landscaped the church plaza in 1896. Unfortunately, two yeas later the church was partially destroyed by revolucionarios. Although the Mill Hill fathers repaired the convento, restoring its neoclassic lines, they demolished the remaining walls of the church, except for part of the façade, to make way for a school.